The Razorbacks (1-4, 0-2 Southeastern Conference) host No. 1 Alabama (5-0, 2-0) on Saturday in a matchup of SEC opposites. The Crimson Tide has won 11 straight games in the series. For Morris, the game will be his introduction to what has been the SEC’s standard for much of Alabama coach Nick Saban’s tenure. 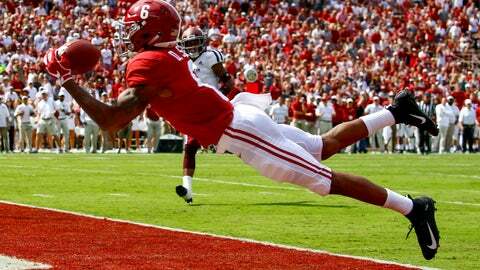 The Crimson Tide have won 77 straight games over unranked teams, a major college football record that began in 2007. Following last year’s national championship, Alabama has yet to face a serious challenge this season and is a 35-point favorite against an Arkansas team that played arguably its best game of the season last week in a 24-17 loss to Texas A&M. “They’ve really gotten better and better as the year’s gone on,” Saban said. Morris’ 1-4 start with the Razorbacks equals the dismal beginning for interim coach John L. Smith during the post-Bobby Petrino scandal season of 2013. Both seasons are the worst coaching beginnings by a Razorbacks coach since Frank Broyles lost his first six games in 1958. Broyles went on to last 19 seasons as the coach of the Razorbacks, though Morris would settle for more improvement — and just one SEC win — at this point. The Arkansas defense, which ranks 13th in the SEC in points allowed, faces an enormous challenge. Led by quarterback Tua Tagovailoa, Alabama has produced at least 500 yards and 45 points in five consecutive games for the first time in program history. Alabama has scored more touchdowns (37) through the first five games than any team in SEC history. Alabama is leading the nation in scoring offense at 54.2 points per game, and Tagovailoa is tops in passing efficiency. Arkansas is likely to be without two key contributors on offense. Senior tight end Jeremy Patton is out after injuring an ankle early in the loss to the Aggies, and Morris said running back Devwah Whaley is doubtful while still recovering from a concussion suffered against Auburn two weeks ago. Alabama has been a quick starter, putting teams in early holes. The Tide scored 28 first-quarter points against Mississippi in its only other game at an opponent’s home stadium. Alabama has outscored opponents 197-20 in the first half, while averaging 358 total yards before halftime. Arkansas linebackers De’Jon Harris and Dre Greenlaw combined for 29 tackles against Texas A&M, with Harris putting together a career-best 16 stops — the most by an SEC player this season. Harris leads the conference with 53 tackles this season, while Greenlaw had two interceptions last week and is the active SEC leaders in career tackles with 271. Saban was impressed enough with Dan Enos the past three years as offensive coordinator for the Razorbacks that he hired him as associate head coach and quarterbacks coach. Saban actually lured Enos away from Michigan, where he’d worked for less than six weeks.